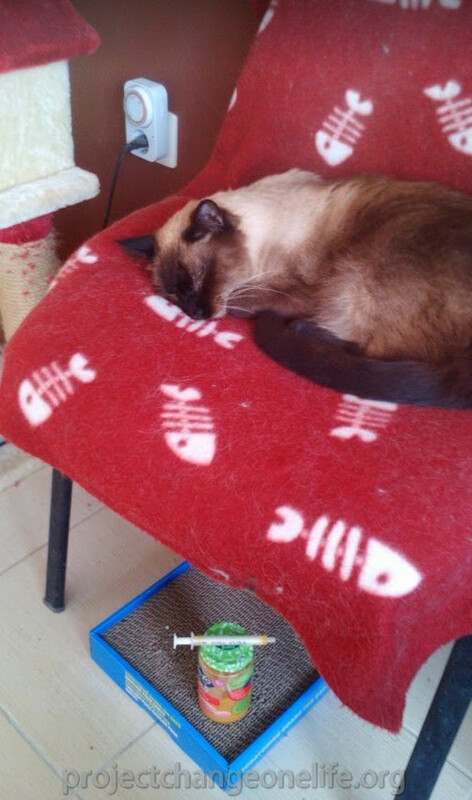 Our cat Sanctuary is on a very tight budget and we are always in need of a little extra help to pay for vet care needed for our rescues, especially the FeLV+ ones. Every bit helps. Please GIVE! Jasmine has been on treatment for 6 days now and she's slighlty more active but certainly not out of the woods yet; it looks like we have a long road ahead of us. Everyday, we find puddles of urine in her bedding, she starting to have a lack of bladder control at night. We place absorbent pads under her blankets so she can stay dry and warm during her sleep until we change her bedding in the morning. Besides the liquid food we syringe-feed her twice a day, she's eats only a few bites of boiled fish but she's still not eating any dry food at all. She's fighting and she has a great will to live but sadly that's not enough. 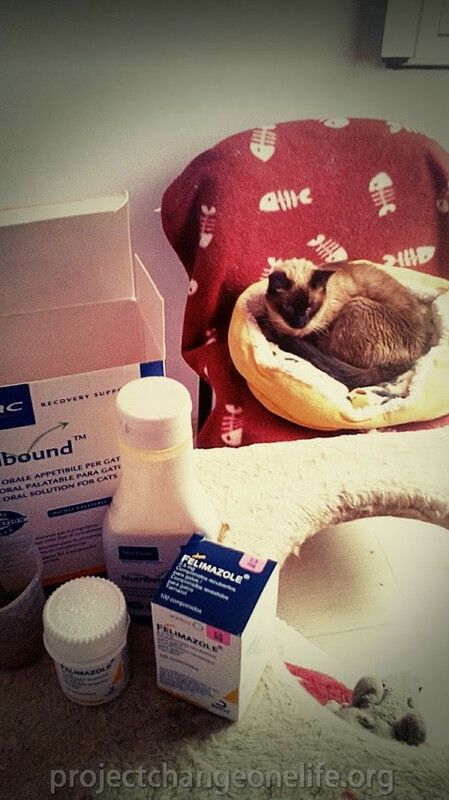 She needs to eat more and gain weight to be able to have surgery as soon as possible so she can stop taking Felimazole, the strong drug that is helping her now but in the long run could also cause severe damage to her frail little body. 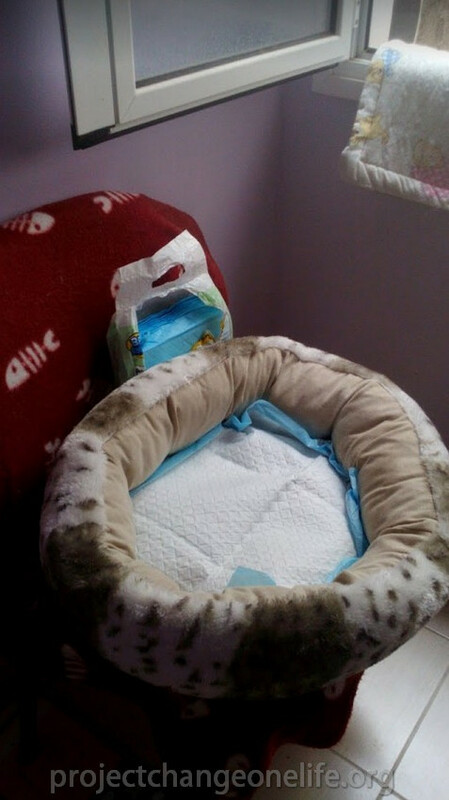 Absorbent pads in Jasmine's bedding. 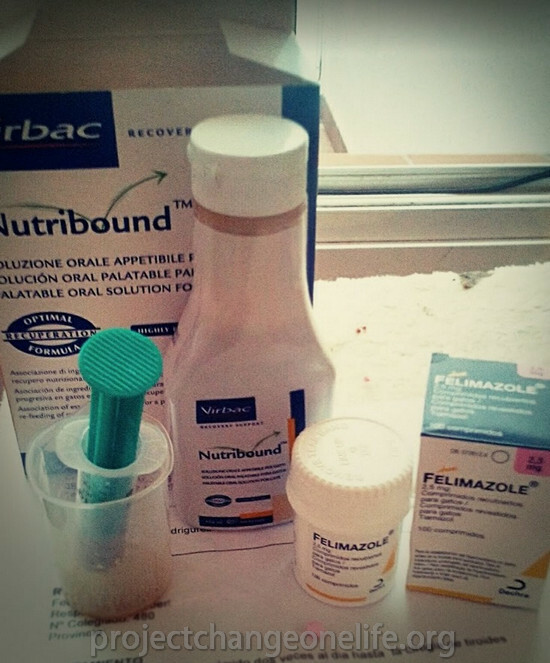 Jasmine is already taking her medication for hyperthyroidism. Our deepest gratitude to all of you who made a donation to help us afford the high costs of her special treatment and vet care. 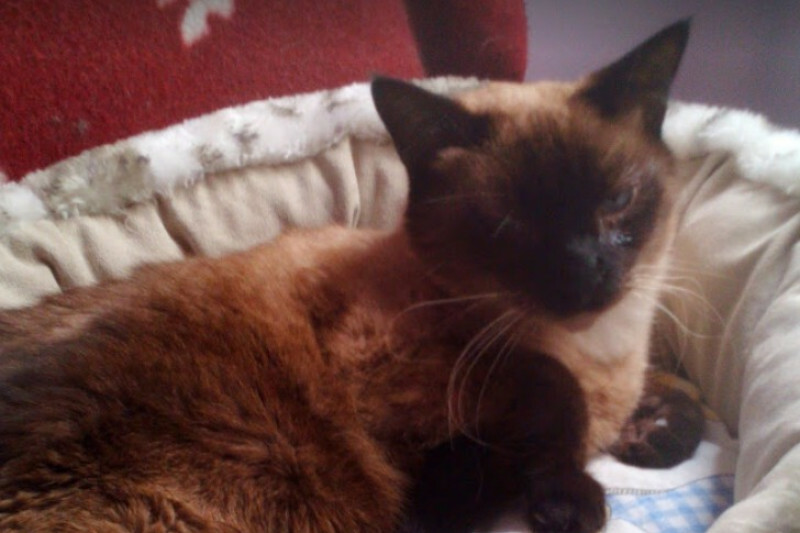 Regardless of her FeLV+ condition, her little frail body is fighting to bounce back. She's taking two pills of Felimazole a day. Blood chemistry profile has to be performed every 2 weeks to adjust the daily dosage if necessary. 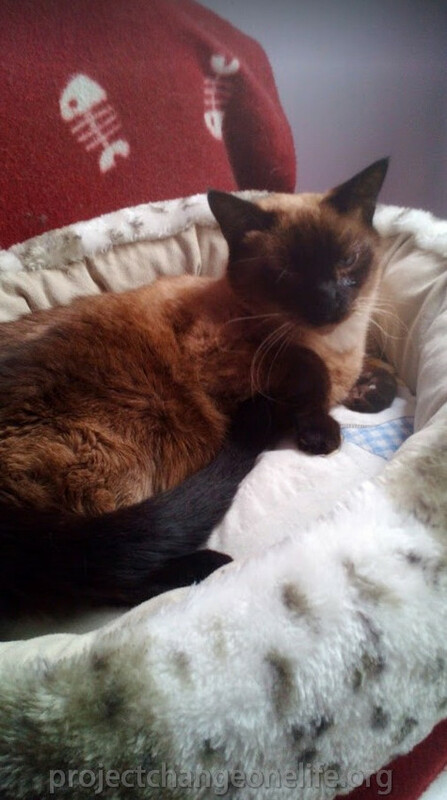 Due to her extreme weakness and thyroid condition, Jasmine is at high risk of heart failure if exposed to any stress at all. Being isolated in a room just for her, has helped a lot. She's resting lots, not so nervous anymore and looks less desoriented. She's still not eating on her own, so we are syringe-feeding her Nutribound, a special oral solution rich in essential nutrients, Omega 3 and vitamins to keep her stable. Hopefully, we should be able to see some progress within the first week of treatment. Her enlarged thyroid gland must be surgically removed once she gain some weight and is strong enough to undergo surgery. Jasmine resting in her room. Jamine's fighting to bounce back! 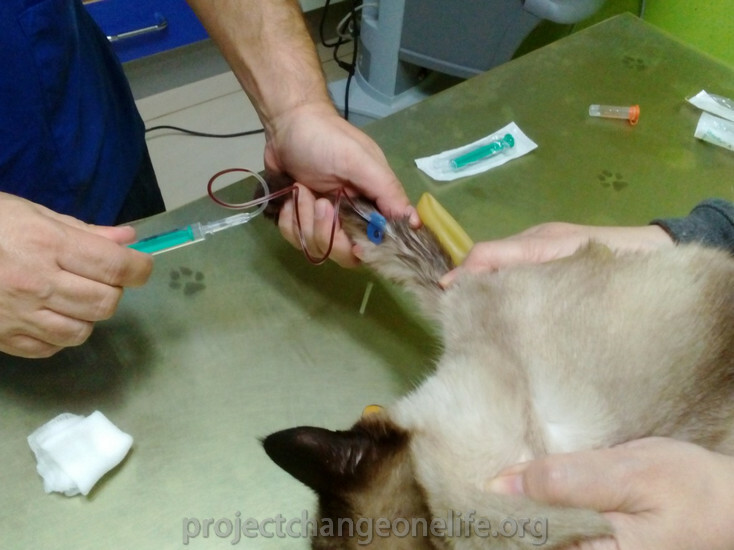 Jasmine’s thyroid problems have worsened and her general condition has deteriorated unexpectedly in just a matter of weeks. 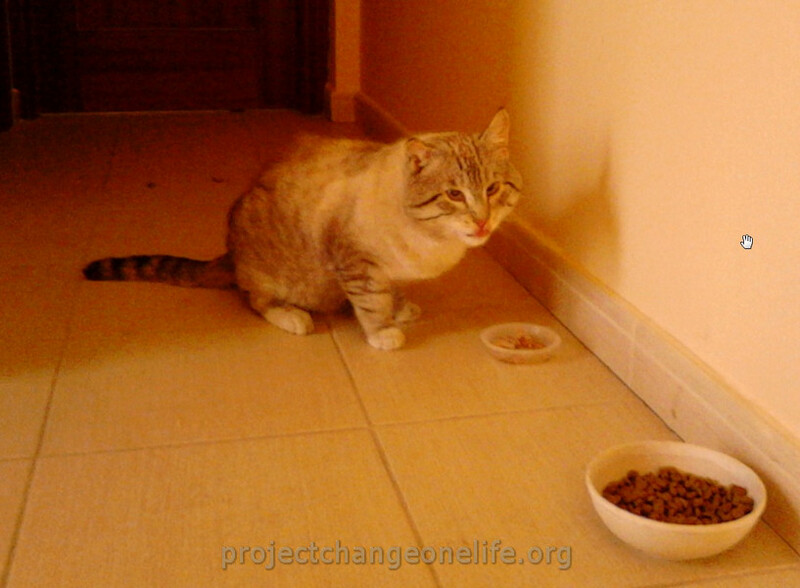 She’s lost a lot of weight; she’s gone from 4.7 kg to 4.1kg in only 8 weeks and lost her appetite. We must syringe feed her baby food to keep her nourished. She started drinking a lot more water than usual and acting desoriented, contsantly going from the litter box to the water bowl. She’s not grooming herself and her coat looks straggly. With her being FeLV + all of these symptoms are a big worry. We booked her in for an emergency appointment at the vet's and after running a few tests it was rather clear her thyroid problem is now the biggest concern. T4 test values went from 3.3 to 3.8. That means she’s becoming a hyperthyroid cat which is in fact the main cause of her drastic weight loss. The lump in her thyroid is not getting any smaller either. We have a new vet appointment tomorrow to determine the best course of treatment in her case. 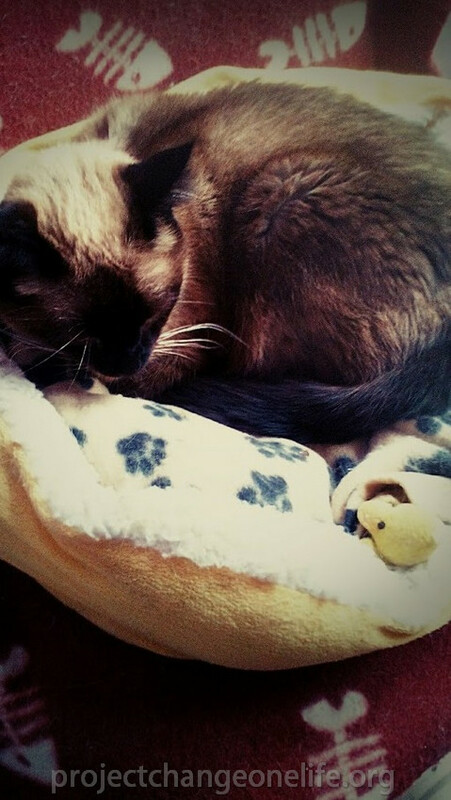 According to the vet, the first option will be having the lump on her thyroid quirurgically removed however due to her overall condition and weakness she cannot undergo surgery at this point so it will have to be treated with special medication for hyperthyroidism at first and see her progress. Last but not least, she was also diagnosed with cystitis. She’s on treatment for 6 days for bladder inflammation with antibiotics/antinflamatory. It’s been a stressful couple of weeks here at the Sanctuary as we are taking extra good care of Jasmine, monitoring her 24/7 and giving her lots of TLC. 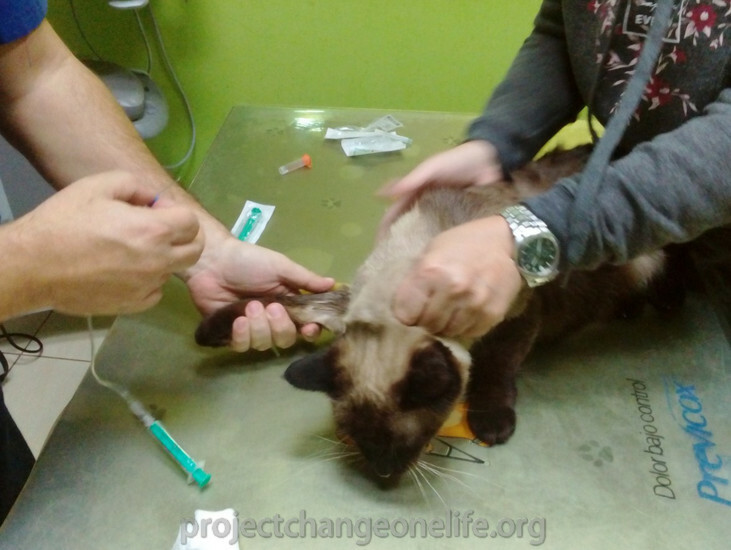 We urgently need help towards Jasmine’s vet costs, please donate. Thank you! Jasmine resting, after vet check up. Bono is our first rescue in 2016! Perseverance paid off and he was finally rescued last Saturday, January 01.16.2016. He has open wounds behind both ears.They scab but then he scratches them off and they start bleeding again. He has an injured front paw that he holds up most of the time and a stiff hind leg that makes him limp. He suffers from strabismus, he has eye focusing problems, he sometimes blinks rapidly and shakes his head quite often. He also has breathing difficulty that we hope is only caused by stress and anxiety. Now that he’s in a safe environment, we’ll be nursing Bono back to health. It’s going to be a slow and long recovery process but it’ll be all worth it in the end! You can either make a kind donation on this fundraiser page (please write “For Bono” in the message field) or you can do it directly through PayPal at Bono’s fundraiser page on our website. First photo of Bono after his rescue. 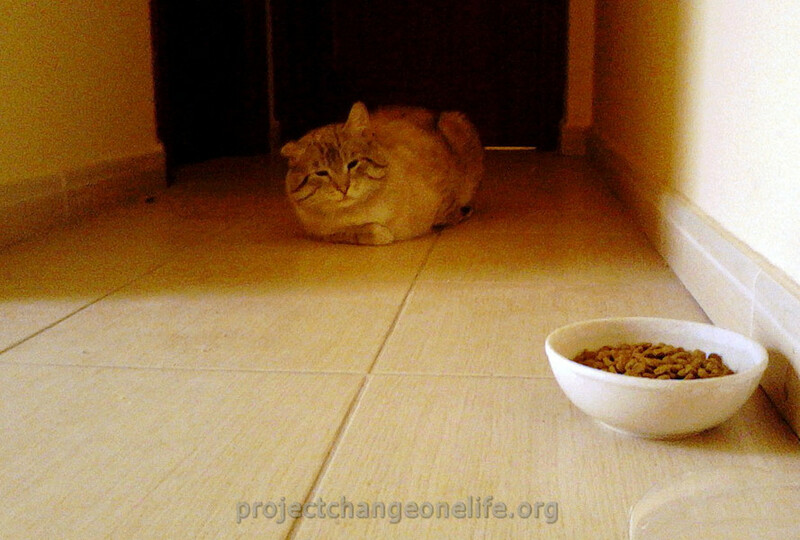 Bono having dinner, home at last! Donated and Praying Jasmine can heal and recover. She is such a sweet and beautiful kitty. Sending lots of hugs! For jasmine Praying for the best! For Jasmine, keep fighting, baby!